One of the things that motivated me to go into SEO professionally in the first place was an interest in how search engines actually work. 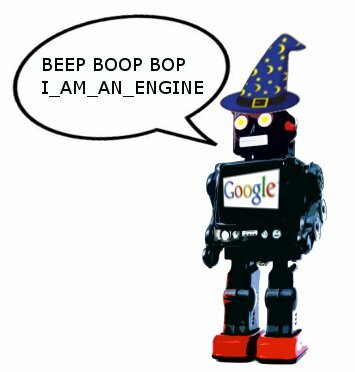 Like almost everyone not in Academia or working in Silicon Valley, I had always thought of search engines as something almost magical; some robot wizards must be flying around in cyberspace making all of this work. If you’re reading this, there’s probably a good chance that you think of search engines the same way that I did. In this post, I’m going to tell a very basic story of how a search engine actually approaches and views a given website. Hopefully, this will de-mystify part of the process, and give you a few pointers on how you can make sure that your site can be properly viewed and understood by engines. In all of this, the key thing to remember is that search engines are run by computer programs, and not people. As a result, any site that wants to be visible in search results needs to be able to communicate with computers first and foremost. On the most basic level, a search engine is nothing more than a bunch of computer programs–each with their own specific roles. These programs work together to allow the search engines to find websites, remember something about their content, and eventually rank them for visitors. One of the most surprising things about SEO and search engines is that it turns out that none of these programs are actually all that complicated. In fact, they each contribute in small, well-defined ways to a very complex whole. Spiders are programs that go out and find new websites. They got their name because they ‘crawl’ the worldwide ‘web’. (Computer engineers really like grabbing on to puns and never letting go.) If you’ve ever spent a mindless session browsing Wikipedia, you might have some sense of what a spider does: they simply follow one link to the next, and make note of their current address. In the same way that you might mindlessly click on Wikipedia links and find yourself re-visiting the second season of Family Matters without ever actually learning or remembering anything along the way, a modern spider’s main role is just to follow the links from one page to the next, making small notes about content, and moving on. Spiders help tell search engines what’s ‘out there’ on the internet, so if you’re a site owner, it’s imperative that they can find everything you want to share on your site. Spiders aren’t that bright, and they’re pretty lazy, so it’s up to you to make sure that they can find everything easily and quickly. You can make this easier on them by doing things like making sure that the pages on your site link to one another wherever possible. If the spider can’t move from one page to another, it will get stuck and give up. If you are interested in attracting traffic from search engines, you need to make sure that the scrapers can easily read your site. Because scrapers work almost entirely with actual text, it’s important to make sure that your content does not appear as images. It’s also important to keep in mind that the scrapers don’t view all content on your site as the same: they are particularly interested in things like title and heading tags, as well as bolded text. Additionally, signing up for tools like Google or Bing Webmaster tools will help alert you to any potential problems that the robots are having while looking at your site. I’m not a technical human and this made perfect sense to me! thanks for the post, Tim (and to whomever wrote the editor’s note…I was concerned there for a minute). Previous Previous post: Are 3rd Party Networks Wasting Your AdWords Display Budget?